A follow-up sequence is a great tool to send a previously set email sequence to new subscribers or to members whose annual subscription soon expires and you want them to renew their subscription. To create a follow-up sequence with SalesAutopilot is very simple. You have to create all the emails of the sequence first. 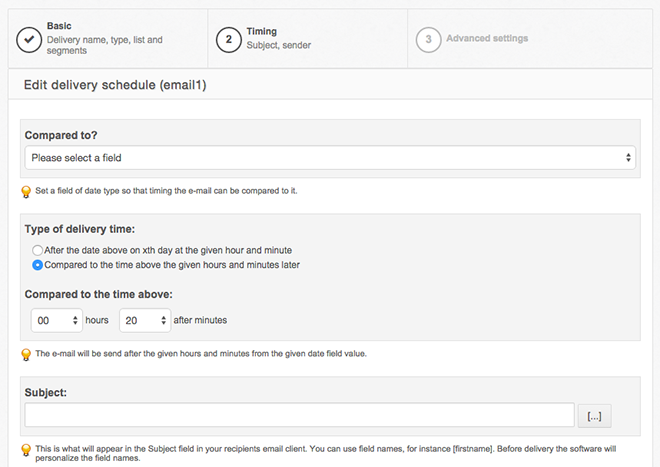 Then, setup delivery schedules to every email. In the delivery schedule setup you have to define a date field. This field stores the reference date of the sequence, for example the date of the signup, and how many days after of before this reference date the email is sent. 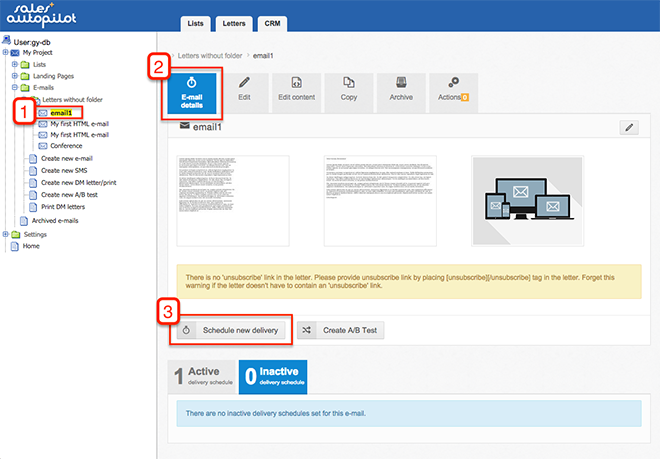 For example in a signup follow-up sequence you have to set in each delivery schedule how many days after signup the email should be sent to the recipient. 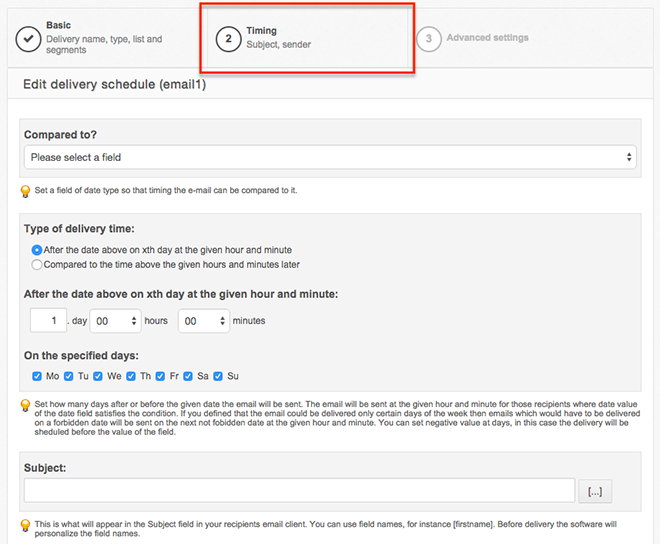 Create a new delivery schedule to the email and set the type to "Relative". Type the name of the delivery schedule and select a list to which you want to send the follow-up sequence. Click the "Next" button. In the second step of the delivery schedule setup wizard you can see the screen below. The relative delivery schedule has two types. First is when you want to send the email one day after signup or later. In most of the cases you will need to use this one. The second type sends email based on the number of minutes passed compared to signup. Choose the latter if you want to send your email 30 minutes after signup. Select which type you want to use. Then, select the date field that you want to use as a reference to calculate the time of the delivery. If you've chosen the "after the following date on a given day at a given hour and minute" type than set how many days after the signup on what day and at what hour and minute you want the email to be sent. If you want the email to be delivered one day after signup at 8:00am, then select the "Subscription date" option in the "Compared to?" dropdown list. And above that set the date to "1day 8 hours 00 minutes". You can set forbidden days for the delivery. For example if you don't want the email to be sent on Saturdays and Sundays uncheck these days. Emails that are supposed to be delivered on these days will be delivered on the next possible day following the forbidden day, in this case, on Monday. If you've chosen "compared to the time below, given hours and/or minutes later" type set how many hours and minutes later you want the email to be sent compared to the time value of the selected field. IMPORTANT: you can choose only time type fields and cannot set forbidden days. The next step is to define the subject line and the sender. Once you've completed all settings click the "Next" button. In the third step of the delivery schedule setup wizard you probably don't need to change the default settings. Click on the "Next" button. The delivery schedules of the email are listed here. First of all, test the e-mail appearance on a few clients or use the SalesAutopilot built-in email preview function. If everything looks okay activate the delivery schedule by clicking the "Activate" button. From that point on the delivery schedule is live and it works. 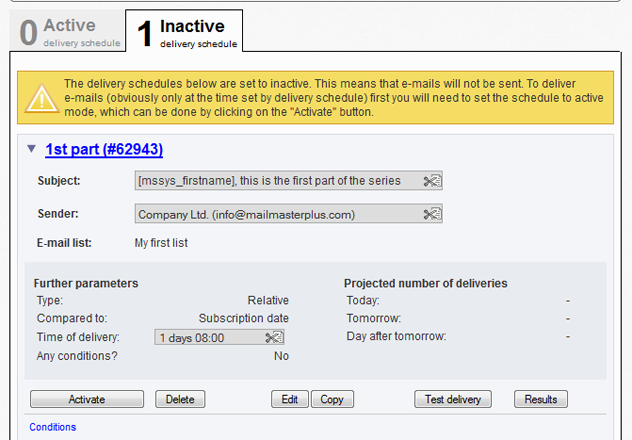 Create the other emails and delivery schedules similarly as it is written above. Set the date of the relative delivery schedules (for example on the 4th day, 7th day, 10th days and the 15th day). You can setup relative delivery schedules not only to subscription date, but to any date type field. You can even set negative numbers or zero in the date of the delivery schedule. For example, you can setup a warning email for an approaching date. Add a date field to the list and store the expiration date of the annual subscription in it. You can setup an email sequence that will be sent 30,15, and 3 days before the expiration. To achieve this create four emails and set relative delivery schedules to them. Set the relative date of the fist schedule to -30 days, set -15 days for the second, set -3 days for the third and set 0 days for the fourth. This last one will be sent on the date of the expiration.